In the tenth pAsuram, AzhwAr says “The dhEvathAs whom you worship, attained their positions by surrendering unto emperumAn; so you too surrender unto emperumAn and be saved”. 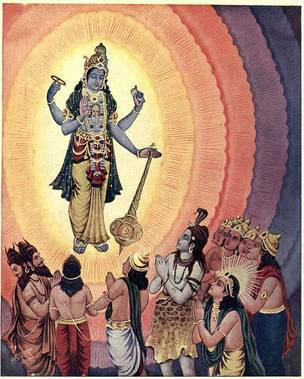 Subsequently, after explaining the greatness of bhAgavathas who are servitors of sarvESvara, who is greater than all, AzhwAr says to those who take shelter of other dhEvathAs for worldly benefits “if you surrender unto emperumAn as done by the dhEvathAs to fulfil their desires, the defects of this [kali] yugam which cause bewilderment of your intelligence will be rid of”. Tenth pAsuram. AzhwAr says “If you do what the dhEvathAs,you have surrendered to, do, your defects coming from many ages will be rid of”. thoNdIr – Oh ones who are desirous of worldly goals! Groups of dhEvathAs together with ISvara (rudhra) who is nagna (naked), brahmA, indhra et al, having taken shelter of the divine form of krishNa who is the shelter for all, became possessed with great wealth everywhere in all the worlds which are having abundance of tools for enjoyment; oh ones who are desirous of worldly goals! if you too are able to worship [emperumAn] like them [those dhEvathAs], none of the defects of kali yugam will be present. Implies that, in this kali yugam, the general public will be averse to worshipping bhagavAn and will mostly be following false doctrines. mikka … – Having krishNa’s distinguished form as the auspicious shelter in all the vast worlds. nakkan … – Having taken shelter of such emperumAn, all the groups of dhEvathAs starting with rudhra, brahmA, indhra et al became located everywhere with great wealth. thoNdIr … – Oh you all who are serving unsuitable [worldly] aspects! if you too take shelter of sarvESvara like them, not only will your defects be gone but also the defects which are induced by the [kali] yugam will be gone. This entry was posted in thiruvAimozhi, thiruvAimozhi 5th centum on June 2, 2017 by Sarathy Thothathri.